FGC BOLSA - FGC FINANCIAL MARKETS INFO: Markets | Investors Wary of Fed's Impact Ahead of Bank Earnings. Markets | Investors Wary of Fed's Impact Ahead of Bank Earnings. Greetings. I'm Jessica Menton, catching you up on the latest in markets. Stock futures are up after the S&P 500 snapped an eight-day winning streak Tuesday amid renewed trade worries. We're awaiting U.S. inflation data. This morning's figures will come ahead of a policy statement from the European Central Bank and minutes from the Fed's latest meeting, due this afternoon. The minutes should provide more color on how officials view global risks to their economic forecast. Investors are parsing just-released earnings from Delta. Costco and Bed Bath & Beyond are slated to report quarterly results after the bell. Most major bank CEOs will face lawmakers on Capitol Hill. Chief executives from JPMorgan Chase to Goldman Sachs will appear today before the House Financial Services Committee for a hearing on post-financial-crisis reforms. 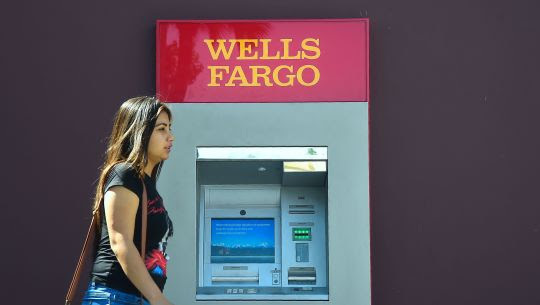 Below, I break down what to watch ahead of first-quarter earnings results from large banks. Global stocks ticked higher Wednesday, even amid concerns about global growth and trade, as well as the U.K.’s stuttering effort to depart the European Union. A pause in rate increases has raised concerns over profitability for banks. Earnings season kicks off in earnest Friday, with JPMorgan Chase and Wells Fargo releasing first-quarter results. That will give investors a first glimpse at how the Federal Reserve’s cautious shift on monetary policy affected the biggest U.S. banks at the start of the year. 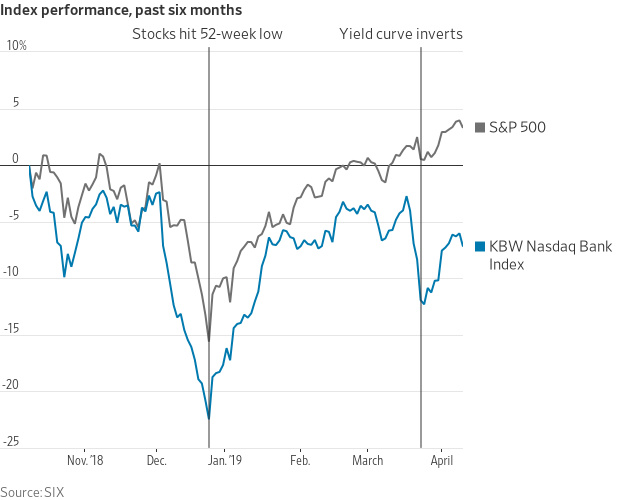 The KBW Nasdaq Bank Index of large commercial lenders has climbed 13% this year, trailing slightly behind the S&P 500’s 15% rise, after sliding 18% in the fourth quarter. Big banks, which were battered in the final months of 2018 along with broader indexes amid heightened recessionary fears, are an indicator for the stock market since their performance tends to reflect investors’ outlook for the economy. The Fed’s shift to caution has raised some concerns over the banking sector’s profitability, and it rattled bank stocks in March after the Fed signaled it was unlikely to lift interest rates this year amid a cautious outlook on economic growth. One measure of the yield curve, the spread between three-month and 10-year Treasurys, also inverted last month for the first time since 2007, causing more jitters as some investors consider an inversion a precursor to a recession. Banks benefit from higher rates because they’re able to charge more on loans, and bank earnings have climbed since the Fed started raising rates in late 2015. Investors will be keeping a close eye on banks’ net interest margins, a key measure of loan profitability. The margin for all U.S. banks was 3.35 percentage points in the fourth quarter, up from 2.95 points in the first quarter of 2015, according to the Federal Reserve Bank of St. Louis. Margins have steadily climbed since early 2015 after falling for a five-year stretch that began in 2010. Investors are betting that the Fed will either keeps rates steady or cut them by the end of the year. While higher rates have generally been good for the banks, they have put a damper on mortgage lending, which is big business for many banks, especially JPMorgan and Wells Fargo. Among the top 24 banks that report their mortgage-banking results, profitability dropped 19% on average in 2018 from a year earlier, according to Inside Mortgage Finance, an industry research group. Next week, Goldman Sachs, Bank of America, Citigroup and Morgan Stanley will report results. Financial companies in the S&P 500 are forecast to report a 4% drop in profits in the first quarter from a year ago, according to FactSet, as the effects of the 2017 tax cuts wane. The S&P 500 Total Return Index, which includes dividends, has climbed 15% so far this year. The index is sitting just 0.7% below its Sept. 20 record, an encouraging sign for its more well-known counterpart. The S&P 500 is 1.8% away from its record. Apple snapped a nine-day winning streak Tuesday, slipping 0.3% to $199.50. Still, shares of the iPhone maker have rallied 26% in 2019, putting the company within striking distance of recapturing a $1 trillion market valuation. Apple's market cap is at $941 billion. On this day in 2000, Jeffrey M. Applegate, chief U.S. investment strategist at Lehman Brothers, recommended that his clients have at least 60% of their portfolios in tech stocks, nearly twice the market weighting. Over the next year, tech stocks lost over half their value as their earnings growth completely disappeared. The European Central Bank releases a policy statement at 7:45 a.m. ET, and ECB President Mario Draghi holds a press conference at 8:30 a.m.
European Union leaders meet in Brussels to discuss an extension beyond April 12 for Britain's exit from the EU. The U.S. consumer-price index for March, due at 8:30 a.m., is expected to rise 0.3% from a month earlier. Excluding food and energy, prices are forecast to rise 0.2%. U.S. crude-oil inventories will be released at 10:30 a.m. Stockpiles are expected to have advanced by 2 million barrels last week, according to the average target of 11 analysts and traders surveyed by the Journal. The Federal Reserve releases minutes of its March 19-20 meeting at 2 p.m. Look for details on views toward the economy, inflation and the Fed's balance sheet. Read Nick Timiraos's preview here. The U.S. budget deficit for March, due at 2 p.m., is expected to narrow to $149 billion from $208.7 billion a year earlier. Fed Vice Chairman Randal Quarles speaks at a Financial Stability Board roundtable at 11:50 a.m., and the Dallas Fed's Robert Kaplan speaks in a moderated conversation with former Fed Chairwoman Janet Yellen at 7:05 p.m.
China's consumer-price index for March is out at 9:30 p.m.
Languishing Wells Fargo is struggling to boost its businesses. Wells Fargo’s 2016 sales scandal has turned into a morass of regulatory problems that won’t go away. Behind the scenes, its business lines are also struggling. China’s giant money-market fund scrapped investment caps. China’s biggest money-market mutual fund is lifting restrictions on how much individuals can invest in it, after suffering through months of outflows to rivals. Saudi Aramco raised $12 billion in its debut bond sale. The issuance sparked massive interest among investors eager to access the world’s most profitable company. Bank of America is raising its minimum wage to $20 an hour by 2021. Bank of America said it is raising the minimum wage so it hits $20 an hour in 2021. Part of the changes will go into effect May 1, when the bank increases its minimum wage to $17 an hour. UBS fired a senior investment banker over a buyout loan. The recent dismissal of a senior UBS banker shows how a government crackdown on leveraged lending is continuing to roil Wall Street. Brexit woes are dimming Northern Ireland’s property market. The country looks especially vulnerable to an adverse outcome of the U.K.’s exit negotiations with the European Union. Standard Chartered will pay $1.1 billion in a settlement over Iran sanctions. The U.K. bank agreed to the payment to settle allegations it violated sanctions on Iran and other countries, marking the end of a long-running probe by U.S. and U.K. regulators that had weighed on the bank’s share price. Levi Strauss: The jeans maker swung to a profit in the latest period with broad-based sales growth, driven by its core men’s pants business. KushCo Holdings: The cannabis packager said late Tuesday that it would have to restate its annual financial statements for fiscal 2018 and 2017 due to an accounting error, which threatens to double its losses in 2018. PriceSmart: The warehouse-club chain's quarterly revenue missed analysts' estimates.